The first March and Walker Crime Novel. Shortlisted for the 2015 HAMMETT PRIZE for literary excellence in crime fiction! Detective Inspector Ellie March of the Ontario Provincial Police is called in to investigate when a man from the village of Sparrow Lake is found shot to death, execution style, in a farmer's field in rural eastern Ontario. Leading an inexperienced team of detectives, she probes beneath the wintry surface of the township to discover the victim had a dark secret--one that may endanger others in the community as well. For young and enthusiastic Detective Constable Kevin Walker, the chance to work with Ellie March is an honour, until the situation turns ugly and unexpected betrayal threatens to destroy his promising career. 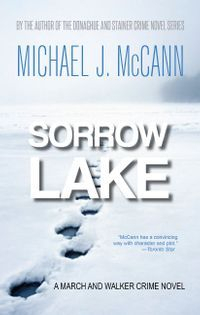 Ask your local independent bookstore to order SORROW LAKE in paperback for you. It's available world-wide through the Ingram catalogue. If you'd like an autographed copy, visit our webstore!